What was the original Silk Road? The Silk Road came into being during the westward expansion of China’s Han Dynasty (206 BCE–220 CE), which forged trade networks throughout what are today the Central Asian countries of Afghanistan, Kazakhstan, Kyrgyzstan, Tajikistan, Turkmenistan, and Uzbekistan, as well as modern-day India and Pakistan to the south. Those routes extended more than four thousand miles to Europe. Central Asia was thus the epicenter of one of the first waves of globalization, connecting eastern and western markets, spurring immense wealth, and intermixing cultural and religious traditions. Valuable Chinese silk, spices, jade, and other goods moved west while China received gold and other precious metals, ivory, and glass products. Use of the route peaked during the first millennium, under the leadership of first the Roman and then Byzantine Empires, and the Tang Dynasty (618–907 CE) in China. But the Crusades, as well as advances by the Mongols in Central Asia, dampened trade, and today Central Asian countries are economically isolated from each other, with intra-regional trade making up just 6.2 percent of all cross-border commerce. They are also heavily dependent on Russia, particularly for remittances—they make up one-third of the gross domestic product (GDP) of Kyrgyzstan and Tajikistan. By 2018, remittances had dipped from their 2013 highs due to Russia’s economic woes. What are China’s plans for its New Silk Road? President Xi announced the initiative during official visits to Kazakhstan and Indonesia in 2013. The plan was two-pronged: the overland Silk Road Economic Belt and the Maritime Silk Road. The two were collectively referred to first as the One Belt, One Road initiative but eventually became the Belt and Road Initiative. 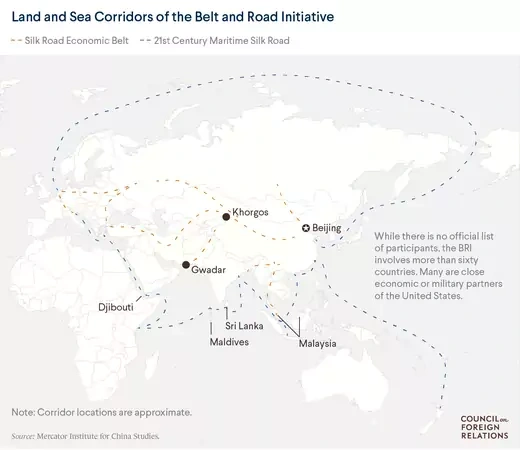 Xi’s vision included creating a vast network of railways, energy pipelines, highways, and streamlined border crossings, both westward—through the mountainous former Soviet republics—and southward, to Pakistan, India, and the rest of Southeast Asia. Such a network would expand the international use of Chinese currency, the renminbi, while new infrastructure could “break the bottleneck in Asian connectivity,” according to Xi. (The Asian Development Bank estimates that the region faces a yearly infrastructure financing shortfall of nearly $800 billion.) 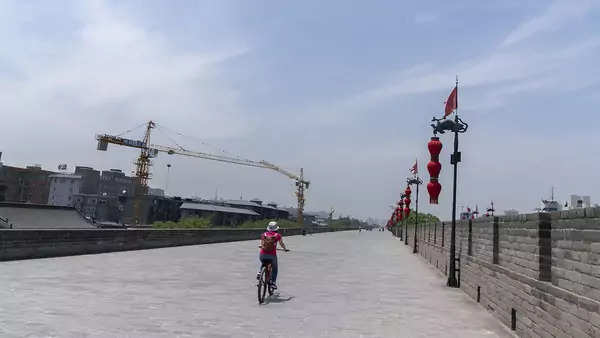 In addition to physical infrastructure, China plans to build fifty special economic zones, modeled after the Shenzhen Special Economic Zone, which China launched in 1980 during its economic reforms under leader Deng Xiaoping. Xi subsequently announced plans for the 21st Century Maritime Silk Road at the 2013 summit of the Association of Southeast Asian Nations (ASEAN) in Indonesia. To accommodate expanding maritime trade traffic, China would invest in port development along the Indian Ocean, from Southeast Asia all the way to East Africa. China’s overall ambition for the BRI is staggering. To date, more than sixty countries—accounting for two-thirds of the world’s population—have signed on to projects or indicated an interest in doing so. Analysts estimate the largest so far to be the $68 billion China-Pakistan Economic Corridor, a collection of projects connecting China to Pakistan’s Gwadar Port on the Arabian Sea. In total, China has already spent an estimated $200 billion on such efforts. Morgan Stanley has predicted China’s overall expenses over the life of the BRI could reach $1.2–1.3 trillion by 2027, though estimates on total investments vary. What does China hope to achieve? China has both geopolitical and economic motivations behind the initiative. Xi has promoted a vision of a more assertive China, while the new normal of slowing growth has put pressure on the country’s leadership to open new markets for its consumer goods and excess industrial capacity. To date, more than sixty countries—accounting for two-thirds of the world’s population—have signed on to projects or indicated an interest in doing so. The United States has shared other countries’ concerns about China’s perceived intentions. Experts see the BRI as one of the main planks of Chinese statecraft under Xi, alongside the Made in China 2025 economic development strategy. For Xi, the BRI serves as pushback against the much-touted U.S. “pivot to Asia,” as well as a way for China to develop new investment opportunities, cultivate export markets, and boost Chinese incomes and domestic consumption. In this sense, Xi’s aggressive approach is a shift away from his predecessors, who followed Deng’s maxim: “hide your strength, bide your time.” CFR’s Elizabeth C. Economy writes, “Under Xi, China now actively seeks to shape international norms and institutions and forcefully asserts its presence on the global stage.” Nayan Chanda, former editor of the Far Eastern Economic Review, calls the BRI “an overt expression of China’s power ambitions in the 21st century,” arguing that Beijing’s goal is to remake the global geopolitical balance of power. Others frame it in less adversarial terms, saying the Chinese leadership simply hopes the BRI will improve China’s image among its neighbors, and help to rejuvenate them economically. At the same time, China was motivated to boost global economic links to its western regions, which historically have been neglected. Promoting economic development in the western province of Xinjiang, where separatist violence has been on the upswing, is a major priority, as is securing long-term energy supplies from Central Asia and the Middle East, especially via routes the U.S. military cannot disrupt. More broadly, Chinese leaders are determined to restructure the economy to avoid the so-called middle-income trap. In this scenario, which has plagued close to 90 percent of middle-income countries since 1960, wages go up and quality of life improves as low-skilled manufacturing rises, but countries struggle to then shift to producing higher-value goods and services. Zhang Yunling of the Chinese Academy of Social Sciences, a state-backed think tank, argues that the BRI will offer new import and export options, creating new production chains that will spur the development of the Chinese economy. How has the United States responded to China-led regional integration? Developing the economies of South and Central Asia is a longstanding U.S. goal that intensified after the start of the U.S. war in Afghanistan and President Barack Obama’s pivot to Asia. The Obama administration frequently referenced the need for the Afghan economy to move past foreign assistance, and in 2014 then Deputy Secretary of State William Burns committed the United States to returning Central and South Asia “to its historic role as a vital hub of global commerce, ideas, and culture.” In this spirit, the Obama administration supported a $10 billion gas pipeline through Turkmenistan, Afghanistan, Pakistan, and India. It also spent billions of dollars on roads and energy projects in Afghanistan and used its diplomatic muscle to help craft new regional cooperation frameworks to foster Central Asian economic links. The Trump administration has pursued a more confrontational strategy in the region. Some analysts have called on the United States to respond by deepening its own ties with Asian partners, as the Obama administration tried to do with the Trans-Pacific Partnership, a deal rejected by Trump in favor of seeking to strengthen relationships on a bilateral basis. The Trump administration, with bipartisan support in Congress, has instead tried to counter the BRI with the BUILD Act. This consolidated the Overseas Private Investment Corporation (OPIC), a U.S. government agency for development finance, with components of the U.S. Agency for International Development (USAID) into a separate agency with a $60 billion investment portfolio. Although this pales in comparison to the more than $1 trillion that financial analysts expect China to spend on the BRI, advocates say it seeks to crowd in a larger pool of private investment by underwriting risk. Some have argued that the United States might find a silver lining in the BRI. Jonathan E. Hillman of the Center for Strategic and International Studies says the United States could use BRI projects as a way to have China pay for infrastructure initiatives in Central Asia that are also in the U.S. interest. What is the role for third countries? Other countries have sought to balance their concerns about China’s ambitions against the benefits that the BRI promises. India. India has tried to convince local countries that the BRI is a plan to dominate Asia, warning of what some analysts have called a “String of Pearls” geoeconomic strategy whereby China creates unsustainable debt burdens for its Indian Ocean neighbors and potentially takes control of regional choke points. Policymakers in New Delhi have long been unsettled by China’s decades-long embrace of traditional rival Pakistan, and since the George W. Bush administration, U.S. leaders have seen India as a regional balancer against a China-dominated Asia. The Trump administration’s 2017 Indo-Pacific Strategy framed India as a counterweight to China’s “repressive vision of the world order” based on “economic inducements and penalties, influence operations, and implied military threats.” India has provided its own development assistance to neighbors, most notably Afghanistan, where it has spent $3 billion on infrastructure projects, including the parliament building, roads, hospitals, and dams. Yet, despite U.S. misgivings, India was a founding member of China’s Asian Infrastructure Investment Bank (AIIB), and Indian and Chinese leaders have invested in developing closer diplomatic ties. “India does a lot with China in the multilateral arena for its own reasons,” says Ayres. Japan. Tokyo has maintained a similar strategy, balancing increasing interest in regional infrastructure development with longstanding suspicions about China’s intentions. In 2016, Japan committed to spending $110 billion on infrastructure projects throughout Asia. Japan has, with India, also agreed to develop the Asia-Africa Growth Corridor (AAGC), a plan to develop and connect ports from Myanmar to East Africa. Russia. Moscow has become one of the BRI’s most enthusiastic partners, though it responded to Xi’s announcement at first with reticence, worried that Beijing’s plans would outshine Moscow’s vision for a “Eurasian Economic Union” and impinge on its traditional sphere of influence. As Russia’s relationship with the West has deteriorated, however, President Vladimir Putin has pledged to link up his Eurasian vision with the BRI. Some experts are skeptical of such an alliance, which they argue would be economically asymmetrical. 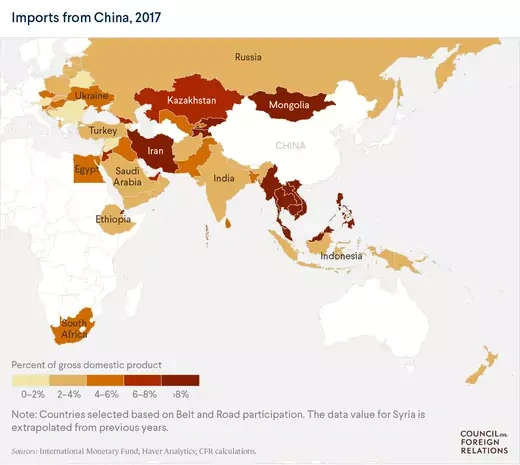 Russia’s economy and its total trade volume are both roughly one-eighth the size of China’s—a gulf that the BRI could widen in the coming years. This Financial Times report on the BRI explores the political controversies—inside and outside China—that it has produced. This Vox video explains the enormous scale and potential geopolitical outcomes of the BRI. The consulting firm McKinsey looks at how the BRI could reshape global trade in this 2016 podcast.